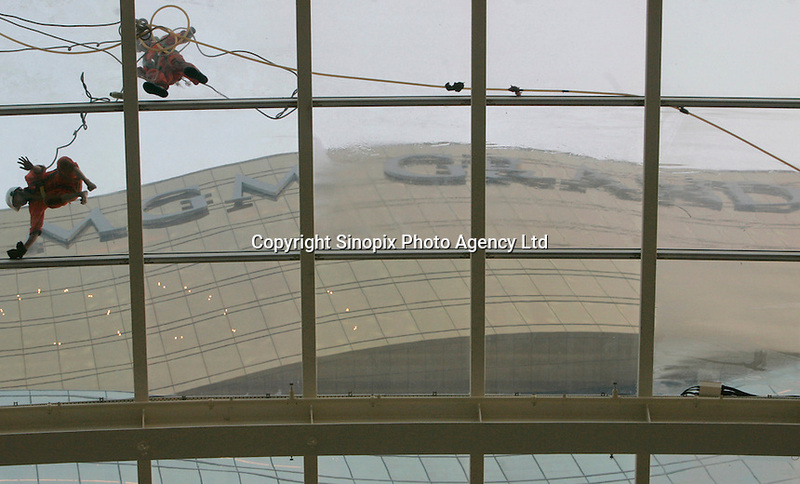 Workers clean a glass roof at the 'MGM Grand Macau' casino, Macau, China, 13 December 2007. When the casino opens its doors to the public next week (Tuesday 18 December 2007) it will be the latest casino to open in the ex-Portuguese enclave that has seen explosive growth in its gaming sector since it was liberalized in 2002. It will also mark the third American gaming operator to enter he increasingly crowded casino industry in Macau, (after the Las Vegas Sands Corporation and Wynn Resorts). The 'MGM Grand Macau' is a joint venture between MGM Mirage and Macau local partner Pansy Ho, daughter of Macau casino kingpin Stanley Ho, and the total project cost USD$1.25 billion to build.